Unlock Bootloader Xperia XZ. The following guide will show you how to unlock bootloader Sony Xperia XZ, also it works on Sony Xperia XZ Premium. For Sony Xperia XZ Premium you can select Sony Xperia XZ from the list. By unlocking the bootloader on your Sony Xperia XZ device, it possible to install a new custom ROM's or custom recovery. If you'are a standard user, we don't recommend to follow this guide. Only follow this guide if you understand what will you do. Unlocking the bootloader will delete everything stored in the phone internal memory, and you may void the warranty from the operator. Also, by doing unlock the bootloader the Sony manufacturer can't give a guarantee and responsible the full functionality of your Sony Xperia device. If you are not lucky, your Sony Xperia device will be damaged, for example, due to the device overheating. Make sure your Sony Xperia XZ device is possible to unlock bootloader with the following method. Open dialer pad on Sony Xperia XZ device. It will access the service menu. From the service menu screen, tap Service info. Unlock Bootloader Sony Xperia XZ. Unlock bootloader also perform hard reset or factory reset on your Sony Xperia device. We highly recommend to backup everything stored at phone internal memory to avoid your personal data is lost. 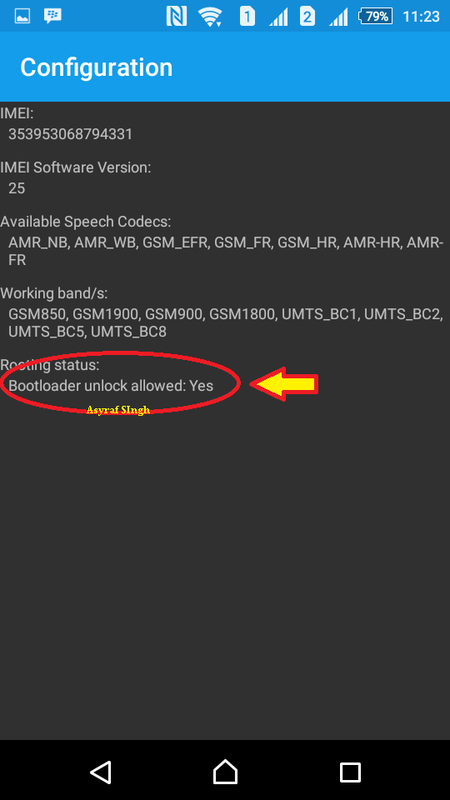 Now see the following guide to start unlocking the bootloader. Enable developer option on your Sony Xperia XZ or XZ Premium. Then on Build number tap seven (7) times to enable developer options. Go into Developer options and enable OEM unlocking. Then, Scroll down this page until reach the end of the page. Now, select your device from select your device list. In this case, you must select Xperia XZ. Then click continue button. At the next page, you must enter your valid email address. Then click the Submit button. Now open inbox in your Email account. You should have the following message in your inbox. Then click the available link at the Email content. You should see click here to proceed link. At the new windows, Enter your IMEI, IDID or MEID number for your Sony Xperia XZ or XZ Premium at the current form. To see the IMEI number, you can also open the phone dialer on your device and enter *#06#. If you enter a correct IMEI number, you will get your Unlock Code, this code is the same as this picture. Install the Android SDK and the device drivers. For OSX or Linux, you are not required to install any additional drivers. Go to Settings > Developer options and Tap to enable USB debugging. Enter Sony Xperia XZ or XZ Premium To Fastboot. Power off your Sony Xperia XZ phone. Then connect your phone to the computer with USB cable, while press and hold the Volume up button at the same time. For Windows users, when asked for a driver, point to the usb_driver folder where you placed the android_winusb.inf-file, and select the Android Boot loader Interface-file. Make sure there's no error message comes up at this step. Once you execute this command, This will not be undone. and your warranty will be lost. Which the bold number is your unlock code. Once again, make sure there is no error message on your computer screen. Done, now you have successfully unlocked bootloader your Sony Xperia XZ or XZ Premium. 0 Response to "How to Unlock Bootloader Sony Xperia XZ and XZ Premium (Official Method)"